Michael Schmidt, PT, DPT, GCS, OCS, FAAOMPT, NCPTA Secretary, was recently selected by the North Carolina Chapter as a 2018 recipient of the APTA Emerging Leader Award. Dr. Schmidt was 1 of 22 members who were selected by their component leadership to merit this honor and he will be recognized in the October issue of PT in Motion Magazine. The Emerging Leader Award was established to annually honor individuals who have demonstrated extraordinary service to the profession and APTA early in their careers. Mike is presently the Director of the Duke Orthopedic Residency and Manual Fellowship. Immediately after graduating with his DPT, Mike enrolled in an ABPTS Orthopedic Residency Program in a clear effort to advance his skills. Following the completion of his residency, Mike enrolled in an ABPTS manual therapy fellowship. 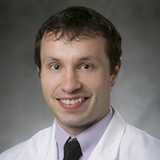 Through his residency and fellowship experiences Mike began to become more involved in clinical research and teaching within the Duke University Health system and School of Medicine. Because of his maturity, skill, and dedication his own and the clinical skills of others, Mike was appointed as a director soon after completion of these programs. Through these experiences Mike has become a regarded and respected clinician, educator, mentor, and clinician scientist in the Duke System. Mike’s trajectory of involvement within the APTA, and NCPTA has followed a similar rising pattern. Mike was recently appointed NCPTA Secretary after former NCPTA Secretary Tania Tablinski moved to Florida. Before being appointed as Secretary, Mike served as the Capital District chair and as the 5th member of the NCPTA Executive Committee. Dr. Schmitt joined the association in 2011. Due to his involvement in manual therapy and teaching of these skills in the fellowship and classroom he became a strong advocate of NCPTA’s ongoing legislative efforts to remove the requirement for physician referral for spinal manipulation. Through this process Mike has frequently met with insurers, legislators, and administrators about the importance of updating our practice for patient-centered care. Mike’s dedication to the profession was quickly recognized by association leaders and he was slated to join the NCPTA Nominating committee. Simultaneously he was elected by his district as the chair. In his role as chair, Mike did much to advance continuing education and fundraising for legislative efforts at the district level.